Welcome! On behalf of the Enrollment Management team we want to thank you for your interest in Latin School. Selecting the best possible school is an important process, and the Office of Enrollment Management is committed to making every family’s experience as personal, informative and stress-free as possible. It is our goal to provide you with everything you need to determine whether Latin is the right school for your family. Our comprehensive admissions process allows us to get to know your student and ensure that he or she can feel successful and happy at Latin. Please look through our website to learn more about the outstanding academic and extra-curricular opportunities, the devoted faculty and the welcoming community that make Latin an exceptional learning environment. 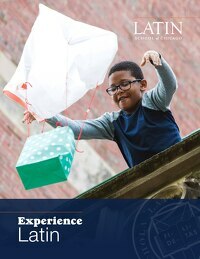 To get a full sense of everything that Latin has to offer, we also invite you to visit our school by attending an Information Session, our fall Open House or scheduling a tour. Do not hesitate to contact our office with any questions at admissions@latinschool.org or 312.582.6060. What does Latin look for in an applicant? What is the percentage of students of color at Latin? Does Latin accept transfer students? What is the ISEE? How and when do I register for it? How many spaces are available at Latin? In what neighborhoods do Latin students live? Applicants apply the year before the expected grade of entry. For instance, students wanting to attend Latin for the 2019-2020 school year can begin the application process in early September of 2018. Latin looks for driven, hardworking and intellectually curious students who want to pursue their passions in the classroom and beyond. Yes, Latin accepts transfer students. Over the years, many students have come to Latin from a variety of schools in the Chicago area, continental United States and internationally. The process for transfer students is the same as for those applying for natural entry points (grades JK, 5 and 9). Admission into grades outside the natural entry points is based on attrition. Notification occurs on a rolling basis as spaces become available. The ISEE is the Independent School Entrance Exam and is a required part of the process for grades 2 through 12. You may register for the ISEE at any time. Be sure to register at least three weeks in advance of the test date. The ISEE is administered at a variety of locations. Visit the ISEE testing site. The natural entry points for admission to Latin are JK, 5th and 9th grade. All other grades are by attrition only. Latin students come from all over the city and suburbs. 96 different neighborhoods in Chicago and 14 suburbs are represented in the student body at Latin. Does Latin have an entrance exam? Is there an ESL (English as a Second Language) Program? Does Latin offer Skype interviews for international applicants? Does Latin work with educational consultants or international student placement agencies? Does Latin offer a boarding or host family program? Does Latin provide assistance in processing student visa applications? Yes. All applicants for grades 2-12 are required to take the Independent School Entrance Exam (ISEE). Students who are not native English speakers are required to submit TOEFL scores (minimum TOEFL score is 100). All international students follow the standard admission process. If English is a second language, you will be required to submit TOEFL scores (minimum TOEFL score is 100). This includes students who currently attend a school where the curriculum is taught in English. No, Latin’s curriculum is designed for students fluent in English. We are unable to accommodate students who are not fluent in English because we do not have a modified curriculum. We strongly recommend all international applicants visit Latin to complete the student/parent interview. If visiting Latin would cause an undue burden on the applicant family, we encourage you to contact our office to discuss alternatives. The Latin School Office of Enrollment Management prefers to work directly with applicants and their families. There is no advantage to working with an outside consultant. Please note: all documents must be translated by a third party professional translation company. All translations must be accompanied by a certificate/affidavit of accuracy. No. All international students must reside with a parent or legal guardian appointed by either an Illinois court or a court in another jurisdiction whose guardianship orders are recognized by Illinois courts. After an applicant has been formally accepted and enrolled at Latin, we will assist in obtaining the I-20 Form. It is the family’s responsibility to then use this form to apply for an F1 student visa. Learn more about our school and programs in our viewbook.